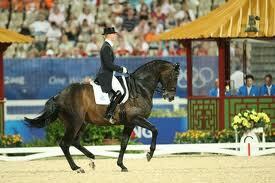 Without a doubt Donnerhall is one of the most outstanding German stallions in the last 30 years. 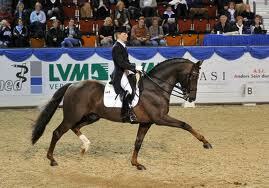 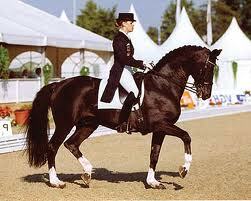 Not only regarding to his own successes in international dressage competitions also regarding to his outstanding prodigy. 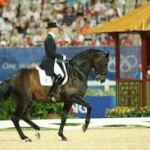 Under his permanent rider and producer Karin Rehbein Donnerhall won 2 team dressage gold medals at the World championships 1994 in The Hague and 1998 in Rome, a bronze medal in the individual dressage in The Hague and 1997 at the European Championships in Verden Donnerhall also won gold with the team and bronze in the individual dressage competition. 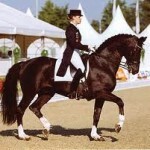 Donnerhalls offspring is evenly successful over 70 of his male prodigy are licensed stallion and like e.g De Niro are also highly ranked on the WBFSH top 100 stallion list. 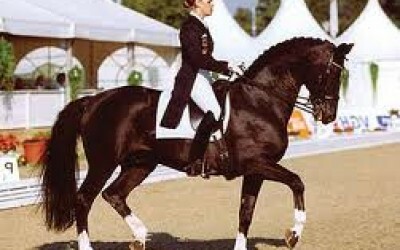 Furthermore he is the sire of more than 400 broodmares this breeding presence consequence in the fact that in the German national finales of the young horses ( Bundeschampionat ) in the year 1998 more than 50% off all horses had Donnerhall in their pedigree. 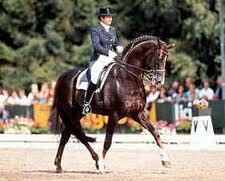 To the most remarkable among his offspring belong such great horses like De Niro (Hanoverian stallion by Donnerhall x Akzent II), Don Primero (Oldenburger stallion by Donnerhall x Pik Bube I ), Don Schufro ( Oldenburger stallion by Donnerhall x Pik Bube I ), Don Frederico ( Hanoverian stallion by Donnerhall x Consul ), Donnerschlag ( Oldenburger stallion by Donnerhall x Pik Koenig), Donnerschwee ( Oldenburger stallion by Donnerhall x Freiherr) Davignon I ( Hanoverian stallion by Donnerhall x Pik Bube I), Duntroon ( Oldenburger stallion by Donnerhall x Pik Bube I) and many more. 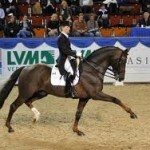 At the present the most sensational Donnerhall offspring are the Donnerhall x Sandro son Digby who is part of the Danish team with Nathalie zu Sayn-Wittgenstein, the Donnerhall x Mozart II son Donnperignon who is international successful with the German Christoph Koschel and the double world champion of the young horses 2005 and 2006 Damon Hill NRW (Westphalien by Donnerhall x RubinsteinI).